**Please note that the Orgone Biomat is scheduled for discontinuation. Please contact us for availability. Orgone Biomat® orders will be processed based on remaining availability. Welcome to the Richway Orgone Biomat. Richway and Fuji Bio’s Biomat technology, patented in 1997, brings life-changing products into your home that are too good not to share. After trying their products for ourselves, we wanted to help others experience the warmth, deep relief and soothing health benefits that Biomat is famous for. There is a reason that Biomat is so popular around the world. Some people use their Biomat for short sessions a couple of times a week, while others use it every single day. We heard from many loyal customers who said they wanted to enjoy the positive impacts of a Biomat overnight, but found they had difficulty sleeping on their regular mats. Richway listened the customer feedback and developed a luxurious solution – the Orgone Biomat. Since Richway first introduced the Biomat in the 1990s, the technology has improved and allowed the company to create a more sophisticated and revolutionary mat that changes the way you sleep. The Orgone Biomat allows you to receive the full spectrum of benefits throughout the night. The Orgone Biomat is the ultimate sleep solution. This luxurious mattress topper comes in various sizes to perfectly fit your bed. Place the Orgone Biomat on top of your bed, under the top sheet, and enjoy deep, rejuvenating, healing sleep that will change the way you experience your everyday. Developed and engineered by Richway, the Orgone Biomat uses the same groundbreaking technology as the original Biomat. We know you’re going to love the way it makes you feel. Every mat is made with the highest quality materials, and you are guaranteed to wake up feeling refreshed and well rested. Over the last 20 years, the Biomat® has been the leading therapeutic grade far-infrared mat highly regarded by health care professionals, fitness coaches and wellness advocates worldwide. The Biomat® holistically combines the latest technology so you can manage you rpain and heal at home. The Orgone Biomat™creates the perfect space for restful and restorative sleep. The Orgone Biomat™ uses the same technology as the Biomat® but is designed to be placed directly on top of your Queen or King sized bed to help you get the sleep you need. It Is comfortable, light weight and easy to clean. After 20 years of research and development, we have designed a holistic concept for sleep that has never been done before. Risk-free purchase with full refund and free trial period. Indicates when far infrared rays are on. Comes on when you set temperature. Light will turn off and the E.D.N.I. light flashes when the temperature is achieved. 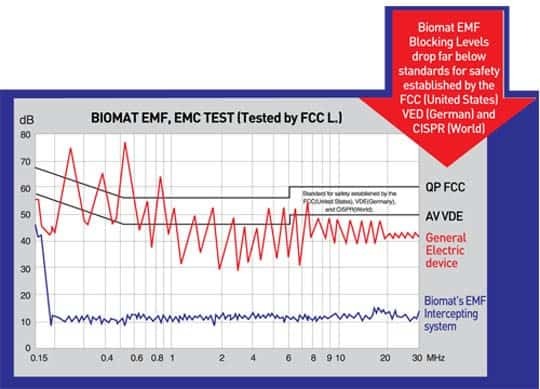 This indicates the usage time before the Orgone Biomat™ turns off. Pressing the button will change the timer setting. This light will appear if there is any malfunction. If so, check connections to ensure they are secure. Contact the dealer if you are experiencing any issues. Use this switch to turn the Orgone Biomat off and on. The Electromagnetic Frequency (EMF) light indicates when far infrared rays are on. Light will turn off and the E.D.N.I. light flashes when the temperature is achieved. This indicator allows you to choose the Orgone Biomat temperature in Fahrenheit. Temperature up and down buttons. Use this button to increase and decrease the temperature setting. This indicator allows you to choose the Orgone Biomat temperature in Celsius. What is an Orgone Biomat made of? Gemstones are long known for their therapeutic and restorative properties. Richway & Fuji Bio Inc. has harnessed the power of amethysts to help deliver far infrared rays deep into your body’s core. Each Biomat is covered with a natural amethyst gemstone fabric that evenly distributes amethyst’s healing energy right where it’s needed most. 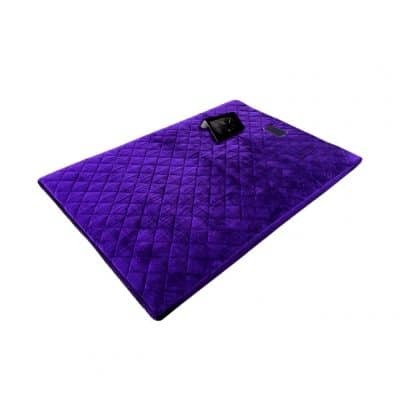 The Orgone Biomat comes with a plush, luxurious microfiber cover. The soft fabric is incredibly easy to spot clean. And best of all? It is extremely hygienic. Dust mites are completely unable to survive in it, and laboratory studies have shown that it inhibits the growth of bacteria such as Staphylococcus aureus and Klebsiella pneumonia. What makes the Orgone Biomat so deliciously comfortable to sleep on? Richway added a dense layer of their proprietary Bio Clay memory foam. The Bio Clay acts like the more conventional memory foam and offers back support to ensure you feel your very best in the morning. As an added bonus, this special layer contains ochre, which naturally contains anti-microbial enzymes to actively help to prevent the growth of bacteria. The original Biomat is designed around amethyst’s healing properties, which is what makes the original technology so effective. Amethyst is a powerful source of far infrared. So when Richway was in the process of developing the Orgone Biomat they wanted to ensure that legacy was repeated in this brand new product. Using gemstone technology, Richway engineers have been able to infuse the fabric of the Orgone Biomat with real amethysts. 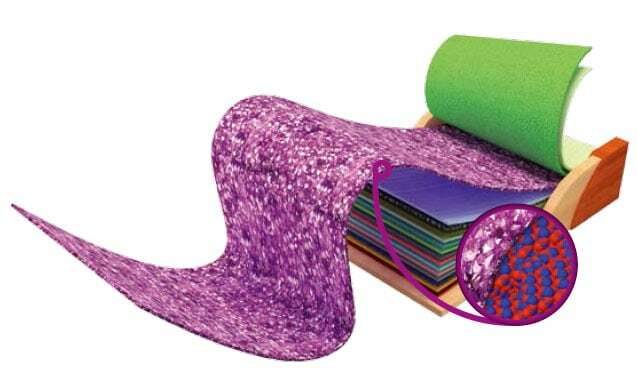 Whereas the original Biomat has a heavy layer of chunky amethysts along the top layer, the Orgone Biomat has a delicate layer of microencapsulated amethysts throughout – which means that you get the same rich benefits built right into a comfortable, luxurious fabric. Tourmaline has long been celebrated for its ability to generate and emit far infrared and negative ions. 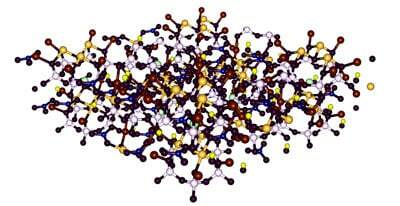 Monazite works to cleanse the body of unwanted toxins. Combined together into one layer of the Orgone Biomat, these powdered gems increase the output of negative ions and infrared energy, delivering the healing properties deep into your body as you rest. Similar to what is found in nature, the increased level of negative ions will help you achieve more restful sleep on the Orgone Biomat than you have ever experienced before. Traditional heating pads have been well documented to emit harmful electromagnetic frequencies (EMFs). These EMFs can block your body’s natural healing process and lead to harmful side effects such as headaches, nausea, anxiety and fatigue. The Orgone Biomat is carefully engineered to sandwich the gemstones layers with three layers of Richway’s patented Nano Copper fabric. This fabric helps to block the low levels of EMFs that are generated by the Orgone Biomat – making it safe to use even for those with EMF sensitivity. Combined with an EMF interceptor, the Copper and carbon fiber layers protect you from the harmful effects of EMFs. No other heating pad will deliver the healing benefits of far infrared energy like the Orgone Biomat. This is thanks in part to the unique fibre layer of peach pit and grapeseed. This layer increases the softness of the mat, and helps it quickly reach – and stay – at the optimal temperature. The ability of mineral oxides to generate infrared ray waves was discovered by NASA. The exclusive BioMat technology harnesses minerals, fabrics and ceramics to convert energy into beneficial infrared ray waves. The BioMat’s advanced technological materials also emit negative ions that energize and refresh the human body. Electromagnetic fields (EMF) are invisible electric and magnetic fields that radiate from electrical devices. All electrical appliances and lines create EMF. Electromagnetic fields disrupt human cellular functioning and create imbalances and disease. The Orgone Biomat controller acts as an EMF interceptor that behaves similar to a lightning rod. The EMF interceptor safely conducts the negative EMF away from you into ground. This feature blocks your exposure to EMF, offering you and your family protection from these harmful fields. Electric blankets and other infrared devices do not offer the advanced EMF protection of the Amethsyt Biomat 7000mx. 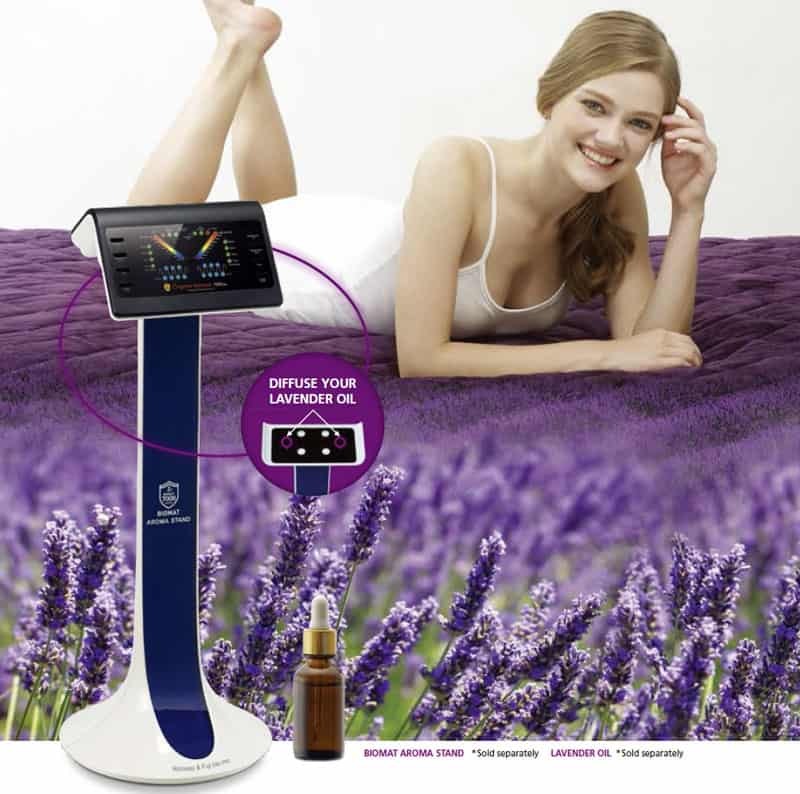 The Orgone Biomat Aroma Stand delivers the relaxing scent of lavender to ease you into sleep so that you wake up refreshed and ready to face the day. It is the perfect accessory for the Orgone Biomat. It will free up space on your night table. 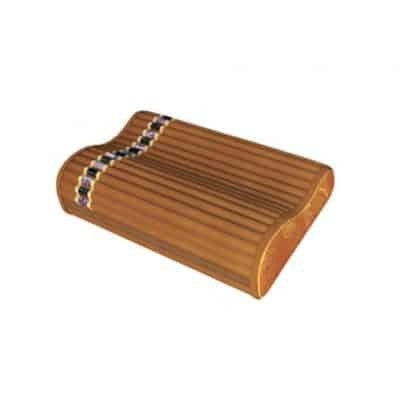 The Orgone Biomat Aroma stand is not included with the Orgone Biomat. Make sure you add it to the cart when you are checking out. You can also use the Aroma Stand to diffuse lavender or other essential oils to enhance your Orgone Biomat experience. 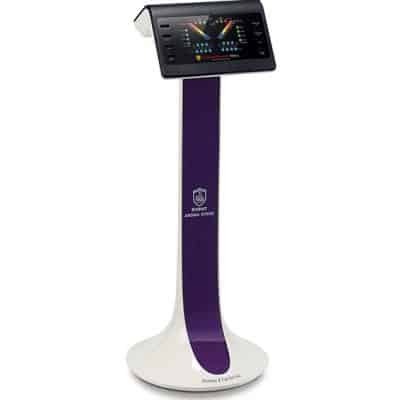 Biomat® is an FDA approved medical device. The Orgone Biomat® is a combination of the traditional Biomat® and the Quantum Energy PadTM, and was created as a more comfortable alternative for those who had difficulty sleeping or lying for extended periods on the traditional Biomat®. It is designed with comfort in mind, and is meant to be slept on night after night. Q. Will I get more benefit from using the Orgone Biomat®? A. The Orgone Biomat® and the original Biomat® emit the same amount of negative ions and infrared rays. The Orgone Biomat® offers increased comfort for those who find the original Biomat® difficult to sleep or lie on for extended periods of time. Q. Can I use the controller from my Biomat® on the Orgone Biomat®? A. No. each product has a controller designed specifically for it. 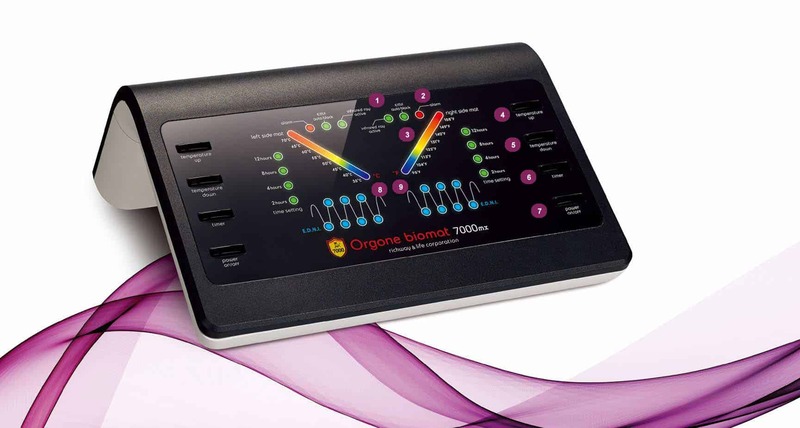 For safety purposes, do not use a Biomat® controller on your Orgone Biomat®, or vice versa. Q. I don’t understand how to use the Orgone Biomat® controller. A. If you are sitting on your bed with your back against the headboard and your feet facing the footboard, the right side of the controller will operate the right side of the mat, and the left side of the controller will operate the left side. If you’ve received an Orgone Biomat® and are still having difficulty, feel free to call the Biomat Shop for assistance. Q. I already have a Biomat®. If I put the Orgone Biomat® on top and use both at once, will I get double the health benefits? A. Never stack any Biomat® products on top of each other, including the Orgone Biomat® and traditional Biomat®. Doing so will not increase the health benefits, and could lead to damage of either or both of your Biomat® products. Q. I am used to lying on the Quantum Energy Pad® over my Biomat®. Can I use the Quantum Energy Pad with the Orgone Biomat® as well? A. Yes, the Quantum Energy Pad® can be used with any Biomat product, and will increase your comfort, allowing you to extend your healing session on the Orgone Biomat®. Q. What is the return, trade-in, warranty and repair policy for the Orgone Biomat®? A. 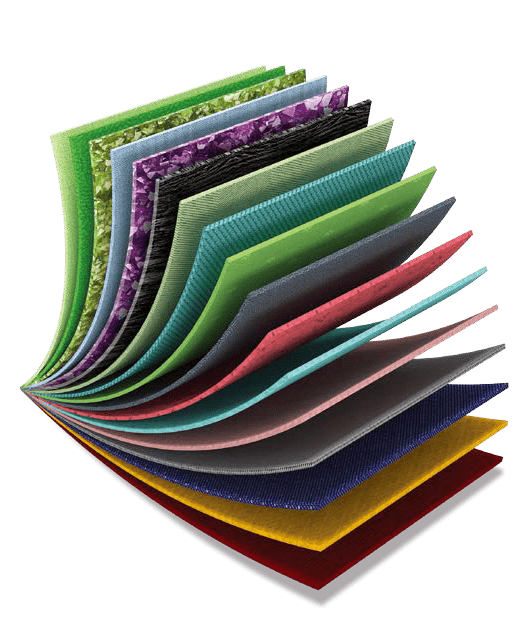 Just as with our traditional Biomat® products, rest assured that the Orgone Biomat® comes with a three-year limited warranty and 30% trade-in option. 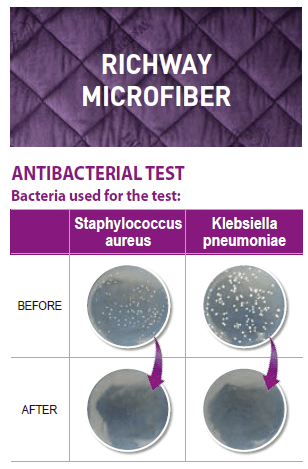 Repair charges for the outer microfiber layer are different. Additional information is available on our Repair Service Policy page. Q. Is the Orgone Biomat® safe for everyone to use? Acute disease or tumor, an external pacemaker, any heart problems, or the visually impaired. We recommend speaking with your doctor about any concerns you may have before using the Orgone Biomat®. Q. Is the Orgone Biomat® safe for by children to use? A. The Orgone Biomat® should never be used by babies and toddlers. Children of older ages may enjoy the benefits of the Biomat® set to lower heat. Q. I don’t understand how the amethysts are used to create the Amethyst Fabric Layer of the Orgone Biomat®. Do I need to worry about the crystals chipping or falling off? A. The Amethyst Fabric is manufactured using microencapsulation. 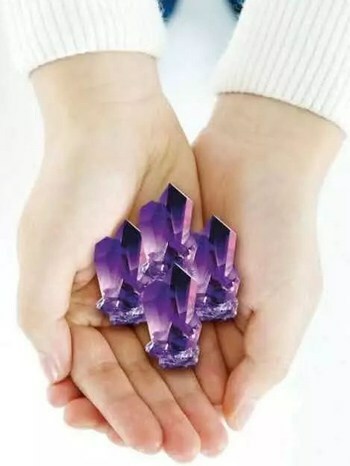 Using this technique, amethyst is fused to the fabric and will remain for the life of your Orgone Biomat®, even with regular and frequent use. Microencapsulation allows for a lighter and more comfortable mat than the traditional Biomat®. Q. Can I sleep on the Orgone Biomat® all night? A. Yes. While the heat of the Orgone Biomat® feels good, you will also reap the benefits of far infrared and negative ions while the mat is turned off. Some people enjoy sleeping on their traditional Biomat® on a low temperature. However, even at low temperatures, some people can experience burns if using for an extended period. Be careful when using within the 104°-158° (40°-70°) heat range. Discontinue use if burns or blisters occur, and turn the temperature down if you start to feel uncomfortable in any way. Additional precautionary measures can be found in the Orgone Biomat® user manual. Q. Is the Orgone Biomat® similar to a foam mattress? A. The Orgone Biomat® cannot be compared to any other mattress topper. The Bio Clay memory foam layer is firm enough to support your bodyweight. The Orgone Biomat® is the perfect way to keep warm throughout the night without heating the room, while at the same time experiencing the healing benefits of negative ions and far infrared rays. Q. Does the Bio Clay memory foam in the Orgone Biomat® emit odors or off-gas? A. The Bio Clay should have very little to no odor. If you have any concerns, you can turn the Orgone Biomat® on and leave it on to air out for 24 hours. Q. Since the Orgone Biomat® has Bio Clay memory foam, is it part of the memory foam anti-trust lawsuit? A. No. The anti-trust lawsuit pertains to several manufacturers in the United States that were involved in price fixing. Q. Is the Orgone Biomat® safe for use on any kind of bed? A. Yes, the Orgone Biomat® is safe for use on any mattress except waterbeds or mattresses that may not be able to tolerate heat. If you are not sure whether your bed it suitable, we encourage you to review the user guide or contact the manufacturer of your mattress. Q. My bed has customizable firmness settings. Will the Orgone Biomat® affect this? A. The Orgone Biomat® will not damage your mattress in any way, and is suitable for any bed type. However, because it sits on top of your mattress, you will not be able to feel the custom firmness settings of your mattress. Q. I have an adjustable bed and like to sleep with my head elevated. Is the Orgone Biomat® flexible enough to use with my bed at an angle? A. Yes, the Orgone Biomat® is designed to be used on any type of bed. It is important to ensure that the angle of your bed or surface you are using the Orgone Biomat® on does not exceed 135°. Q. Why is the price for shipping the Orgone Biomat® the same as the Biomat® if they don’t weigh the same? A. We ship all Biomat® products through UPS. Shipping prices are determined by package dimensions rather than weight, also known as dimensional weight. Q. What is the serviceable life of the Biomat? A. The serviceable life of the Orgone Biomat® is 5 years.